This journey started with sprouts. Run with me. We Googled it and it turns out there is no benefit to the cooking or the taste of sprouts by doing this, in fact, it can waterlog them! Generation after generation have done it because their parents or grandparents did too! A great example of a dysfunctional belief, quite harmless, and it got me thinking. 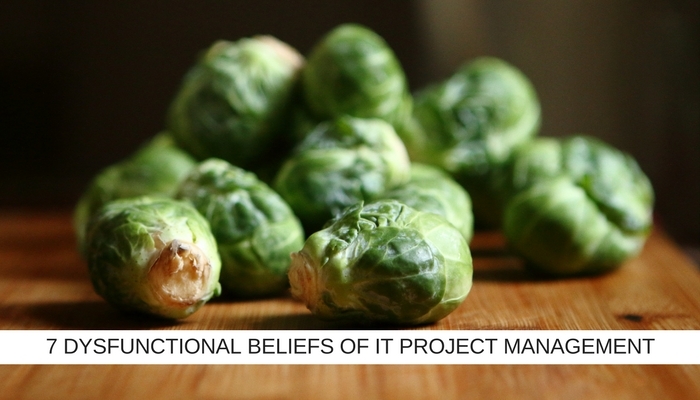 Could there be dysfunctional beliefs in IT Project Management and could their impact be a little more serious than some soggy sprouts? An IT Project where the scope doesn’t change mid-lifecycle is a rarity these days. It doesn’t have to always be a red flag for trouble or impending project failure, in fact, thinking back to projects I’ve been involved with recently, scope changes can actually be the catalyst for improved delivery. It’s how you manage scope change that is key and I guess that comes down to how well you’re set up to manage it. Projects that anticipate scope changes (or see them as potentially positive) enjoy better results than projects that have a blinkered view or don’t expect any change. Knowing when to allow scope change and knowing the direction of travel for your project after a scope change are key to riding it out. qualified PM, for instance, might not be up to the job. OK, experience is a good hiring criteria but it’s not the only one. Attitude, education, training, an individual’s approach to managing projects, how well they fit the team or are aligned with your company culture are all really useful indicators too. Furthermore, experience is subjective and to measure it just by time spent in the job may not be the most effective path to tread. Tom has ten years IT Project Management experience, whereas Jerry has three … who would you hire? Tom, right? What if you discovered that Jerry had a 100% success rate during that three years and Tom had been in charge of a couple of projects that had failed during his decade? Suddenly, Jerry’s the man … right?! BUT Tom would probably have learned a lot from those failures and Jerry is probably due a howler … yes … but Jerry has a fresh perspective and no baggage … you can see how experience is in the eye of the beholder? The above, by the way, is based on actual recruitment conversation I once heard (although the candidates weren’t called Tom and Jerry). ‘Jerry’ got the job and five years on still has a 100% delivery success rate. Some projects benefit from a fresh set of eyes, a fresh perspective – don’t rob your project of potentially greater success by only ever hiring the manager with the most years on the clock. A huge project management dysfunctional belief is that hard facts, figures, and multi-coloured spreadsheets are the only criteria upon which to base decisions and strategy. Of course, they are all vital but, alongside all those charts and information, a healthy dose of good old-fashioned human intuition can really benefit IT Project success. One of my colleagues often reminds me that IT project delivery is all about people, end users, stakeholders, project team members, etc, and while Excel is great for monitoring data, people don’t always fit that neatly into a spreadsheet cell. In addition to this, data only comes to life when it is interpreted. Different perspectives, conclusions, and insights, from human beings, add colour to decision making and strategy formation. A regular misconception is that clients and stakeholders know what they want. Usually, they have a firm grip on what they are hoping to achieve and how it is aligned with business case. However, rarely do they have a complete idea of how realistic their ambition is against project budgets and delivery timescales, nor do they usually know what you will actually need to do to deliver their vision. I consulted on a struggling project a few years back that had such contradictory stakeholder goals that, in trying to deliver them all, the project team was tying itself in knots! As a Project Manager, you need to be super focused on your client’s requirements, know what they want (even when they don’t!) and communicate it back in a way that they understand so that they can agree. It is very easy to deliver a project that you think ticks every box and find that, in reality, it missed ticking most. knowledge and experience to deliver, business case and culture were aligned. At first glance it was solid, on further investigation it turned out that the project template being used had been used before … admittedly, with great success … but that was then. Past glory is never a guarantee for future success. Often the methodology, tools, and resources that made one project a hit do not translate onto the next one. I think it’s like using a map that you used to drive into town ten years ago before the bypass and the roundabout with the McDonalds on it were built. Like an old map, a previous template doesn’t necessarily describe the landscape you are travelling through now and it’s easy to get lost. In this case, the project team had planned well and were executing based on the plan perfectly but the new project had subtle differences that were enough to render the old template redundant. Attention to detail matters, of course, it does. Often it’s those little details, executed well, that deliver great success. IT Project Leaders need to be careful though that they are not too zoomed in on them that they take their eye off the bigger picture, for instance, business case alignment. I would challenge what I once heard a CIO say to a Project Manager. The PM was questioning the project’s alignment with current market need but was told that this was out of both their “circles of concern”. In other words, we’ve been commissioned to deliver X, Y, and Z and if they are no longer congruent with business case then that’s someone else’s problem. “The business” pays all our wages and in the same way that a marketing or sales strategy needs to be in line with business needs, so too does an IT Project, otherwise what’s the point? So sure, zoom in on the details but also zoom out once in a while and take a helicopter view of your project and where and how it fits. Like the templates mentioned above, Project Managers are not always transferrable. Just because Tom delivered his last project successfully, that doesn’t mean you’re guaranteed a happy ending with the next one. PMs are a bit like snowflakes, no two are the same! Tom might have the same training and certificates on his wall as Jerry but just as each project is different, so is each project manager. Different talent brings different skill sets, experience, attitudes, vision, insights. It’s all about matching your resources with the needs of the Project and that can take an honest appraisal of both. Often a fresh pair of eyes is best placed to do this, an independent project management office analysis can help shine a light on any gaps. There’s no shame in recognising that your brilliant team lacks certain capabilities and the Project Management as a Service market is ready to provide complementary talent and resources. In conclusion, recognising project management dysfunctional beliefs is a really healthy thing to do, attending to them and actively working towards dispelling and destroying them could actually save your project from harm. And … do you know what? It’s really liberating. When you realise that you’ve been working under a fog of misconception you are set free to succeed. Once that haze lifts, your best practice can shine through. Previous Where does an IT Project Manager’s job end? Next Is it time to rethink how to recruit specialist IT talent?